john4jack (Corvallis, Oregon, United States) on 27 November 2009 in Transportation and Portfolio. The crew of 8-10 people who put in a 12+ hour workday for our benefit were all volunteers (volunteers who love trains). BIRTHDAY CANDLES EXPLANATION - Fiona's cupcake had 7 candles; Grandpa Jack's had 4. Grandpa was 74. That is a fine shot of the hogger's station on board. Splendid b/w for this document so interesting, great photo! Great shot...like the way you've managed detail in the shadows Jack!! What a great scene,nice one. Excellent work here.. like it a lot. Wow, I'm stunned by this one - strong contrasts you applied here but it works and gives beautiful oily blacks ! superbe série sur ces vieilles machines ! très beau NB ici sur la mécanique ! Beautiful image. The processing is fantastic. un beau nb sur un sujet peu montré, j'aime bien ! superb framing and BW ! interessant documentary ! Considering their efforts, this could be titled 'Dedication'. A great and detailed shot, Jack! Cool environmental portrait. Love all the details suggesting what he must know. Anpother good image for your "blurb" book ;) Love to see those engineer hats. I have an old hat and pair of engineer overalls that my dad used to use. He worked for the Santa Fe for 45 years. 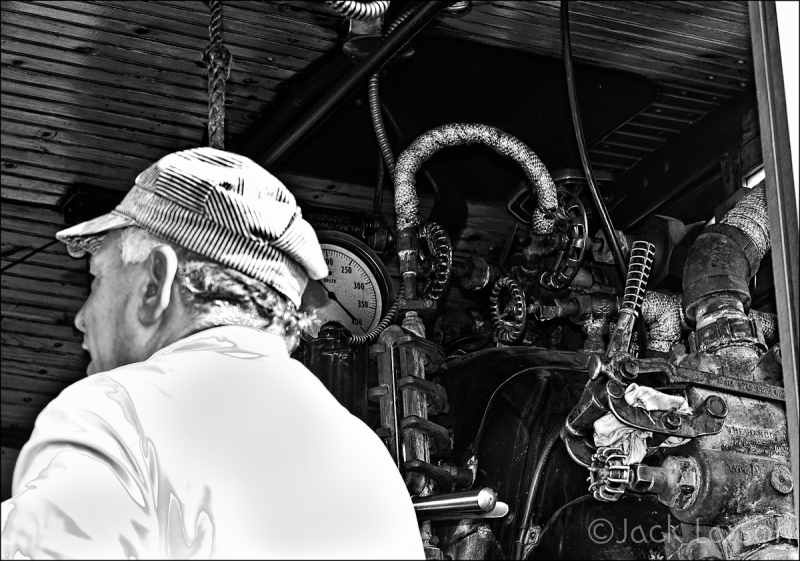 Great processing in B&W which really provides a lot of contrast between all of the mechanical elements. Is it just me or does he look a bit like Casey Jones? A great documentary shot. A fine shot of the workman in the setting of his machinery which he no doubt loves. A very effective image. and.. I love pictures of trains! Great Jack! It must have been a wonderful day even if it was long. Wonderful shot, wonderful processing. Nice view over that hall of mechanics. Great catch of the inner workings!! looks like you had a superb time on this little venture!!! @B. Thomas: Yeah; engines are a guy thing. Nice picture of this old machine. Engines always look very complicated. Love the befitting tone. A gorgeous shot. Love the B&W. I can feel power of the engine. Nice BW shot. excellent contrasts -- amazing frame and detail! !